James Crumley discusses his novel "The Final Country"
Often called a cross between Raymond Chandler and Hunter Thompson, Texas-born James Crumley is the author of twelve novels. He died in 2008. Gary Phillips discusses "The Perpetrators"
A prolific novelist, Gary Phillips has worked as a union organizer, political campaign coordinator, radio talk show host and teacher. Michael Ledwidge discusses his novel "Before the Devil Knows You're Dead"
Michael Ledwidge is the author of "The Narrowback" and "Bad Connection." He has also written five novels in collaboration with James Patterson. Bob Truluck discusses his novel "Saw Red"
Bob Truluck is a building contractor and novelist living in Florida. J Milligan discusses his novel "Jack Fish"
J Milligan is the author of "The Wisdom of Big Bird" and lives in Brooklyn, New York. Sean Doolitte is the author of "Dirt" and is busy on his next novel. Ben Rehder discusses "Bone Dry"
Ben Rehder is a novelist living in Texas. Tim Dorsey discusses "Torpedo Juice"
Tim Dorsey is a novelist and former newspaperman living in Florida. Scott Phillips is the author of several novels, including "The Ice Harvest." George Pelecanos discusses "Hard Revolution"
Novelist George Pelecanos is also a contributor to the awarding winning HBO series "The Wire." Jenny Siler is a writer living in Maine. The late Donald Westlake discusses "Money for Nothing"
Author of over 100 books and a three-time Edgar Award winner, Donald Westlake is a renowned and prolific mystery writer. He died in 2008. Daniel Woodrell discusses "The Death Sweet Mister"
Daniel Woodrell lives in the Ozarks. Victor Gischler discusses "Gun Monkeys"
Victor Gischler is a writer and professor living in Oklahoma. Sam Hill Discusses "Buzz Monkey"
Sam Hill is a media insider and journalist whose work has appeared the Wall Street Journal and Fortune among many others. He lives outside of Chicago. Jerry Stahl discusses "Plainclothes Naked"
A novelist, journalist, and screenwriter, Jerry Stahl lives in L.A.
Jim Nisbet discusses "The Price of the Ticket"
A novelist, poet, and furniture maker, Jim Nisbet lives in San Francisco. 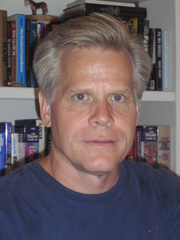 Rick DeMarinis discusses "Sky Full of Sand"
Rick DeMarinis is a novelist living in Montana.